A year-round favorite of mine, lace is a supple, ladylike fabric that looks good just about any time of day. 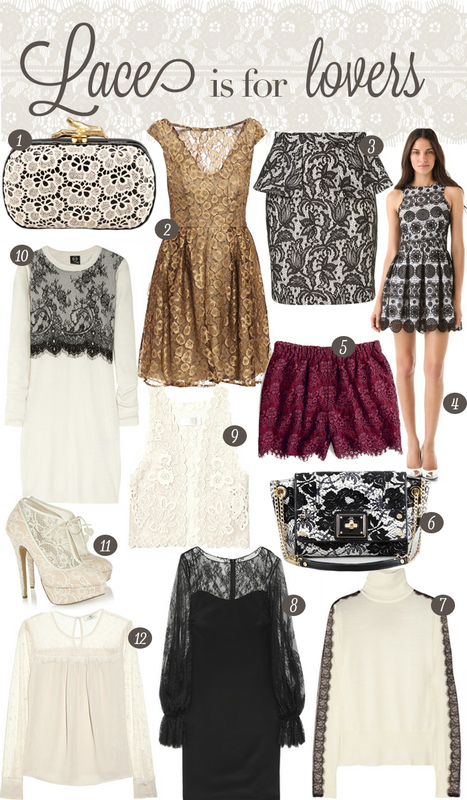 Whether it’s trimmed on a sweater or the spotlight on a cocktail dress, lace makes any look just a bit more luxe. Black lace overlay seems to be quite popular this season, but I also love the simplicity of a crepe blouse with lace details. I’m thinking this Day Birger et Mikkelsen piece is just the feminine fundamental I need this fall. Love all of these picks! Lace is so lovely and feminine. My favorite lace shirt just bit the dust, so I’m currently on the hunt for a new one. Love the lace shoes :) I have always wanted a pair of lace-inspired shoes, but have yet to get a pair! Dreaming about these ones now!